THE HAGUE - The St. Maarten police cells became a point of discussion during a meeting of experts with the First Chamber of the Dutch Parliament on Tuesday about Venezuelan migrants and refugees in Curaçao and Aruba, when National Ombudsman Reinier van Zutphen brought up the matter of the violation of human rights at St. Maarten’s detention facilities. Van Zutphen was one of the five experts who were invited by the First Chamber’s Permanent Committee for Kingdom Relations to share their views on the responsibilities within the Kingdom for the protection of human rights in the Dutch Caribbean, in particular the case of the thousands of Venezuelans who have fled to Curaçao and Aruba. The National Ombudsman, who formally has no jurisdiction in the Dutch Caribbean countries, but just in the Netherlands and the Dutch public entities Bonaire, St. Eustatius and Saba, spoke not only of the degrading circumstances at the barracks at the Curaçao SDKK prison where migrants await deportation, but also mentioned the St. Maarten police cells in relation to a recent ruling of the European Court of Human Rights in the case of the arrested casino boss Francesco Corallo. Van Zutphen called the ruling of the Court in Strasbourg in the Corallo case – in particular where it regards the circumstances of detention at the Philipsburg police station and the violation of human rights – “devastating.” “It is incomprehensible that this happens in our Kingdom,” he said. Van Zutphen said St. Maarten and its some 40,000 inhabitants barely had the capacity to pull together the financial resources to secure detention facilities that complied with all standards. “So, this has to happen in a different manner,” said Van Zutphen, who worked as a judge in Curaçao and St. Maarten for five years, earlier in his career. In his opinion, the Kingdom government has a responsibility to ensure that these facilities in St. Maarten comply with the European Convention for Human Rights and the standards of the European Committee for the Prevention of Torture CPT. The CPT committee has written some highly critical reports about St. Maarten’s detention facilities. “If it costs money to detain someone under the correct circumstances, then so be it. We simply have to do it. This needs to happen for people who are detained. We have to make sure that the means and the will are there to get this done,” Van Zutphen said. “The responsibility lies primarily with the Kingdom to make sure that we comply with our obligations under the treaties.” He added that the will to assist each other, as stated in the Kingdom Charter, also had to come from the side of the Netherlands. 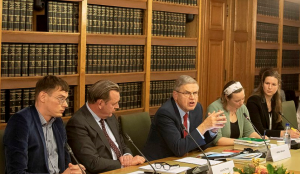 Member of the Second Chamber André Bosman of the liberal democratic VVD party, who attended Tuesday’s meeting with the experts, immediately responded to Van Zutphen’s remarks. He questioned whether St. Maarten did not have the resources to ensure proper detention facilities. “There is sufficient money in St. Maarten, especially before Hurricane Irma,” he said, adding that there were too many hotels and well-off citizens who did not pay their taxes. Bosman specifically referred to a meeting the Dutch Parliamentary delegation had had with the St. Maarten Council of Ministers in June this year in which the urgent, complex situation of the Pointe Blanche prison had been discussed. He said Justice Minister Cornelius de Weever had literally said that if the problem at the prison worsened enough, it would become a problem of the Kingdom. One of the five experts, Maarten den Heijer, an associate professor of international public law at the Amsterdam University UvA, agreed that the will for cooperation had to come from both sides. He said this particularly with regard to the human rights situation of the Venezuelan migrants in Curaçao and Aruba. Member of the Advisory Council for International Issues professor Ernst Hirsch Ballin said the Kingdom partners had the obligation to assist each other. He said internal issues of the countries should never be an excuse to violate human rights. Where it concerned the authority of the Kingdom government to get involved, Hirsch Ballin said there were enough options between hard intervention on one side and a laissez-faire attitude on the other side. Matty Verburg of Amnesty International painted a grim picture of Venezuela, its inhabitants and the mass migration that has been ongoing. She said that in Curaçao, where Amnesty International did an investigation, there were an estimated 26,000 Venezuela migrants, about 15 per cent of the Curaçao population. According to Verburg, the Venezuela migrants did not receive any assistance from Curaçao authorities, but rather detention and deportation. She said the circumstances at the detention barracks where foreigners are locked up until deportation and in the police cells were very poor and that this constituted a human rights violation. She said many Venezuelans disappeared in illegality because they did not seek protection and asylum from Curaçao authorities out of fear of detention and deportation.